Major changes for this season include adjustments to estimated facility fees and the re-introduction of funds put toward advertising. Our playoffs will be taking place this Saturday, October 20th, at Desert Hills High School (828 East Desert Hills Drive, St. George, UT 84790). An image of the field layout has been attached to this post. Consult your Player(s)' Playoff Bracket (see below) and then cross reference it with this diagram to know where your player(s) are playing. 1. 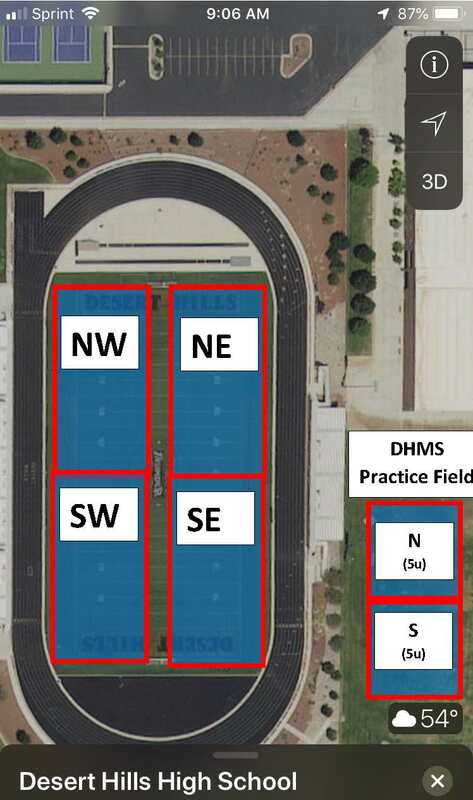 The 5u playoffs will be playing on the west practice field at Desert Hills Middle School. This area has been identified on the image. 2. If you are specating a game on the turf football field, please do not sit anywhere on the turf. You may sit on the track or in the endzones, but no spectators on the turf. You are welcome to sit in the football stands as well! For a better view on a PC, open the image in a new window. On a smartphone, you should be able to zoom in on it. Registration Open July 1 - July 31st! Get your team together! | Use TABS to left or Click here to Register! Includes NFL Jersey and Flags | Use TABS at Left or Click Here to Register! Regular Season August 22 - October 3; Playoffs on Saturday, October 20th | Click Here to Register! 2-20 min Halfs ~ 1 hour | Use TABS at Left or Click Here to Register! 12u, 10u, 9u, 8u, 7u, 6u & 5u Divisions! Age determined as of June 1, 2018 | Use TABS at the left or Click Here to Register! Will be assigned by geography | Use TABS at the Left or Click Here to Register! | Use TABS at the Left or Click Here to Register! Follow us on Instagram & Facebook! | Use TABS to left or Click Here to Register! Coach QB is designed to allow our youngest players a chance to recieve the ball cleanly on offense while they are developing their individual skills as a football player. The playing format is 3 offenseive players (plus the Coach QB) vs 5 defensive players. The Coach plays QB on offense to faciliate a clean hand off and/or good throw. Each offensive possession will begin at the "no run zone" line just inside mid-field and the team will be given 4 downs to score. If the team scores the ball is turned over to the other team at the same starting point and direction. No extra point plays on touchdowns will be played. Additionally, no official score is taken, nor will the 5u Coach QB teams have a playoff at the end of the regular season. 1) If you expect your 5-year old to an aggressive player, put him/her in the 6u. 2) If you expect your 5-year old to be nervous or overwhelmed in the 5 vs 5 format, put him/her in the Coach QB 5u. 3) If your 5-year old knows the basic rules of football AND can take a handoff and catch a 10 yard pass with ease, put him/her in the 6u. 4) If your 5-year old has no handoff or pass catching experience, put him/her in the Coach QB 5u. 5) If you want to put your 5-year old in the Coach QB 5u just to see him/her dominate, put him/her in the 6u because you will be defeating the purpose of the Coach QB 5u (entry level football). We hope this explanation helps. Please email us at suff.nfl@gmail.com with any questions. Click Here for Access to BUZZ. Which Division should I register my player in? We have 12u, 10u, 9u, 8u, 7u, 6u, and 5u Coach QB Divisions. You might be asking why not just do it by grade? Our answer to that is sometimes a player or parent may want the opportunity to play up for a variety of reasons (more competetive, friends or siblings on older team, etc). This is our main reasoning for dividing the leagues the way we have. To determine what age divisions your son or daughter qualifies for, first determine how old he/she will be on June 1, 2018. For example, if a player is 8 on this date he/she can play in the 8u league and also up in the 9u and 10u leagues if he/she chooses, but cannot play in the 7u league or lower because he/she is too old. 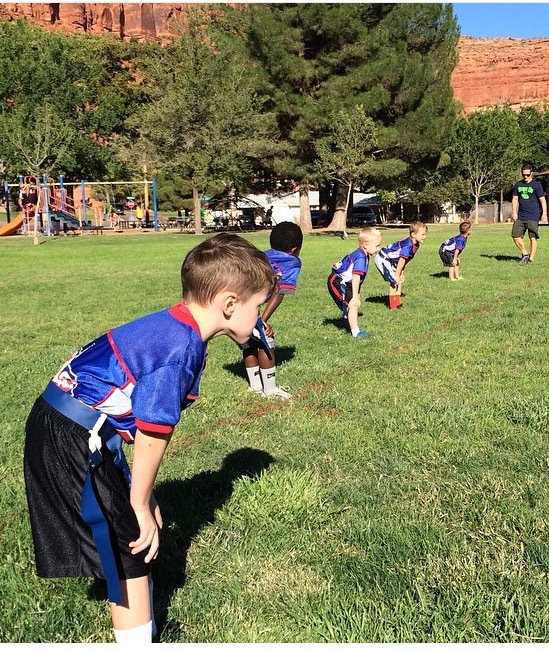 Copyright © 2013 Southern Utah NFL Flag Football. All rights reserved. 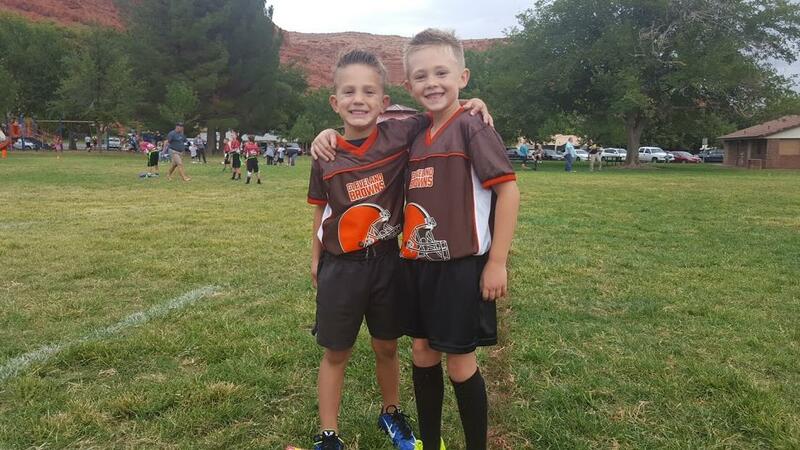 Copyright © 2001 - 2019 Southern Utah NFL Flag Football. All Rights Reserved.